Don’t Leave It Up to Your Immune System to Take Care of Workplace Germs! We all dread the day we wake up with flu-like symptoms. Aches, a runny nose and a sore throat are all major setbacks to our lives. Throughout the year is important but it is most crucial during flu season to ensure that our workplace is not only “clean”, but disinfected. Keeping your personal desk space disinfected with wipes and hand sanitizer can be beneficial in preventing the spread of germs. You are, however, handling numerous surfaces besides your own desk including door handles, handrails, phones and public restrooms. The typical worker’s hands in an office space comes in contact with 10 million bacteria per day. that we, as workplace professionals, shouldn’t have to make. To ensure the ultimate defense against bacteria, leave it to the professionals! The modern, professional cleaning technology called EnviroShield® is a reliable and effective way of protecting ourselves from bacteria. 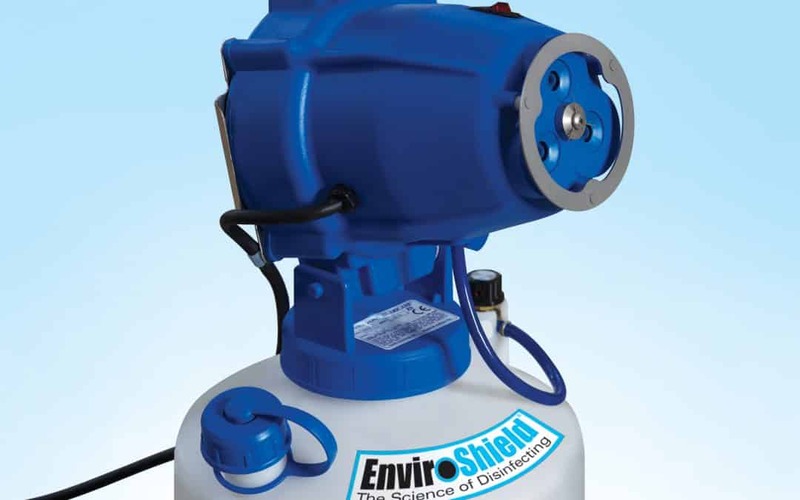 The EnviroShield® system supplies total disinfection using a spray method that reaches surfaces other cleaning methods can’t. The odorless disinfectant is EPA-rated as the safest in its class and doesn’t cause skin, eye, or respiratory issues. The solution is not only safe for everyday use, but powerful enough to kill 99.9% of harmful bacteria. EnviroShield® is a cleaning method developed by JAN-PRO, a commercial cleaning company that has provided an advanced level of service since 1991. JAN-PRO is the world’s #1 commercial cleaning brand.